A bipartisan group of nine U.S. senators, after meeting for nine months behind closed doors, is nearing an agreement on the broad strokes of a health care reform bill. The so-called Gang of Nine  though its number expands and contracts depending on the meeting  is hammering out the finer points as they prepare to enter the drafting phase of the negotiations, sources from three Senate offices involved in the talks tell TIME. The talks have been held in parallel to negotiations orchestrated by Sen. Edward M. Kennedy, chairman of the Health, Education, Labor and Pensions Committee, which has principally involved outside groups like insurers, doctors, labor and big business. Aides to the bipartisan group of lawmakers, citing the delicacy of the talks, provided no details of the potential agreement. However, the two main sticking points remain how to pay for a plan that some estimate could cost as much as $1 trillion and how to integrate a public, government-run plan into the private system, two aides say. Last June’s Senate health care summit helped spark the closed-door gatherings, which at first involved just six members: Senate Finance Committee Chairman Max Baucus of Montana and the committee’s top Republican, Charles Grassley of Iowa; Ted Kennedy and the HELP Committee’s top Republican, Mike Enzi of Wyoming; and Senators Jay Rockefeller of West Virginia and Orrin Hatch of Utah, the chairman and ranking member, respectively, of the Finance Committee’s Subcommittee on Health Care. In recent months Senator Chris Dodd of Connecticut, a top HELP Committee Democrat, was added as Kennedy’s understudy as the Massachusetts Democrat sought treatment for brain cancer. 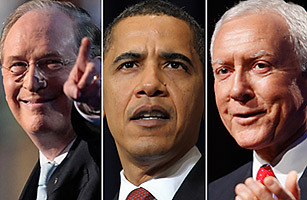 Senate Budget Committee Chairman Kent Conrad of North Dakota and his GOP counterpart Judd Gregg of New Hampshire were also added after President Obama included his $634 billion outline for health care reform in his 2010 budget request. Other senators from the Democratic leadership and the HELP and Finance Committees have been intermittently involved, and the core group has encouraged participation of as many members as possible. Having the Senate Budget Committee leaders involved in the talks is especially noteworthy, as it suggests the group is grappling with the issues of Paygo  a requirement that all new spending be offset by reductions to avoid adding to the deficit. Their presence could also indicate the group is considering moving the final bill through budget reconciliation, the end-of-the-year budget bill that needs only a simple majority of 50 votes to pass the Senate, avoiding a potential GOP filibuster. Republicans have repeatedly warned Democrats about trying to pass health care in that fashion, saying it goes against the spirit of a normal legislative process for such a sweeping bill. Many Democrats have argued, in return, that President Bush pushed several large initiatives through this same process, such as his tax cuts and deficit reduction legislation. But Rockefeller recently said that he worried trying to use budget reconciliation to pass health care reform would effectively poison the well. “If you go for budget reconciliation, you’re basically going for a bill that goes nowhere,” he said. Baucus announced last week a schedule to have his up his side of the bill marked up by the end of June. Starting in late April the Finance Committee will hold a series of public round tables followed by closed-door, member-to-member sessions on the delivery system  public or private, or some combination of the two  in which individual members can weigh in on their own plans and ideas. Other issues of coverage, cost containment and prevention and wellness will see similar treatment, aides say. The HELP committee will have its own schedule on the prevention and wellness provisions, as well as the parts of the bill involving the Employee Retirement Income Security Act , which regulates employer-offered health insurance plans. Rockefeller will first hold his own series of hearings in March and early April on quality, long-term care and the importance of a competitive and open bidding process.